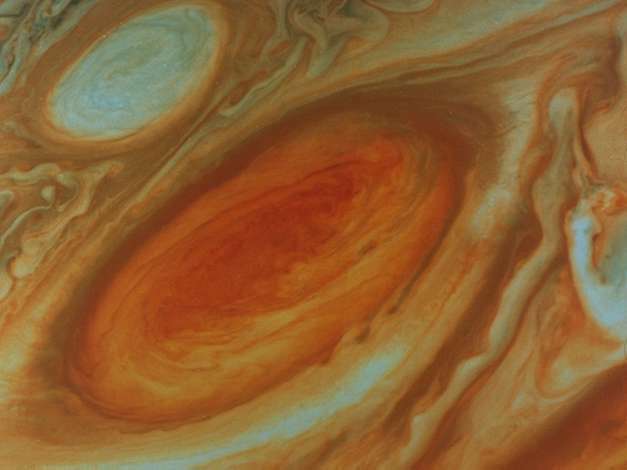 Information: This mosaic of the Great Red Spot shows that the region has changed significantly since the Voyager 1 encounter three months earlier. Around the northern boundary a white cloud is seen, which extend to east of the region. The presence of this cloud prevents small cloud vertices from circling the spot in the manner seen in the Voyager 1 encounter. Another white oval cloud (different from the one present in this position three months ago) is seen south of the Great Red Spot. The internal structure of these spots is identical. Since they both rotate in an anticyclonic manner these observations indicate that they are meteorologically similar. This image was taken on July 6 1979 from a range of 2,633,003 kilometers.